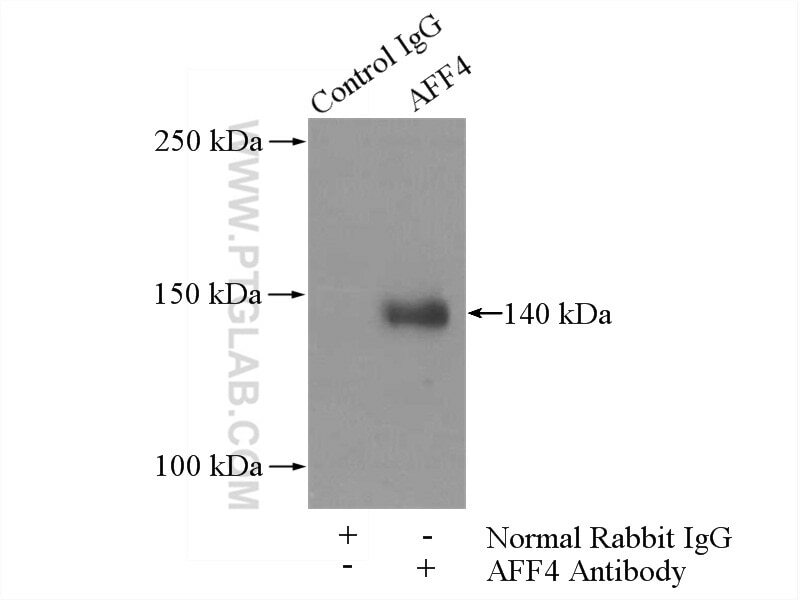 IP Result of anti-AFF4 (IP:14662-1-AP, 4ug; Detection:14662-1-AP 1:300) with HepG2 cells lysate 3200ug. Transcriptional controled by RNA polymerase II (Pol II) is a multi-step process requiring the concerted action of multiple factors and contacts with the DNA template for the proper synthesis of nascent RNA [PMID:12676794]. ELL1 was demonstrated to be a Pol II elongation factor capable of enhancing the catalytic rate of transcription elongation by reducing transient pausing by the enzyme [PMID:8596958]. AFF4 was initially identified as a fusion partner of the MLL (mixed-lineage leukemia) gene participated in infant acute lymphoblastic leukemia, and a component of the ELL/p-TEFb elongation complex. AFF4 interacts with positive transcription elongation factor-b while also repressing Tat transactivation of HIV-1 [PMID:17389929].